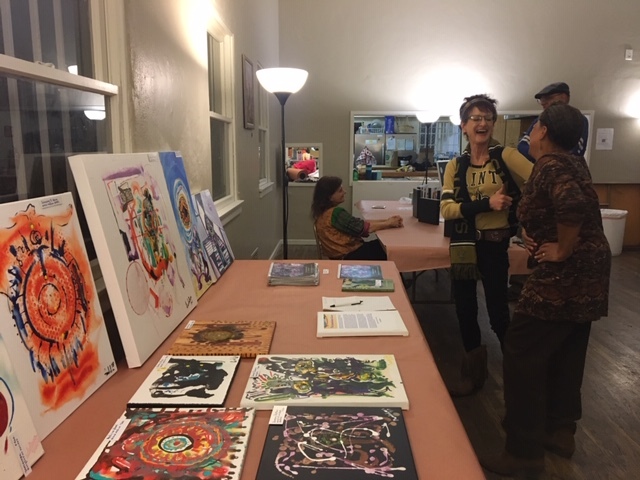 Oneg Shabbat pop-up Gallery opened for the first time! Our organization, Oneg Shabbat, – North East Los Angeles Jewish Collaborative, partnered with Temple Beth Israel to host the event in the shul. Six artists came from all over the city to exhibit their work along side live music and food as part of the North East LA Art Walk. The hall was filed with paintings and prints and we kicked off with a communal Havdalah. Minimal lighting and the video-art of Shasha Dothan against the background of stained-glass windows, transformed the sanctuary space. Visitors could wander through the social hall and enjoy the art, or step outside for the cool night air (and/or a cigarette) in the shul’s native-plant garden. We were pleased to feature the art of: CG, Shasha Dothan, C. Nolan Fansler, Shlome Hayyun, Guadulesa Rivera, and Hillel Smith. Live music performed by Josh Kaufman (on accordion) and Cory Beers (on Cimbalom!). There was also vegan cholent and kishka, for those who were feeling a bit peckish. The original Oneg Shabbat (or Oyneg Shabbos), after which our organization is named, was a group of artists and literary and religious figures who met in the Warsaw Ghetto to collect cultural material and hide it for preservation. Their concept was to document the entirety of Jewish life in the ghetto, for a book they intended to write after the war. The documents survived the war buried in milk canisters, unfortunately many of their authors did not. Their inclusive view of Jewish culture, religion, art, and society is an inspiration for us. Oneg Shabbat -NELA Collaborative is an organization providing modes of Jewish spiritual expression that include prayer, art, music, literature, gastronomy, and storytelling. We’re talking about ideas like pickling fairs, havdalah chandlery, and sit down Shabbat dinners.